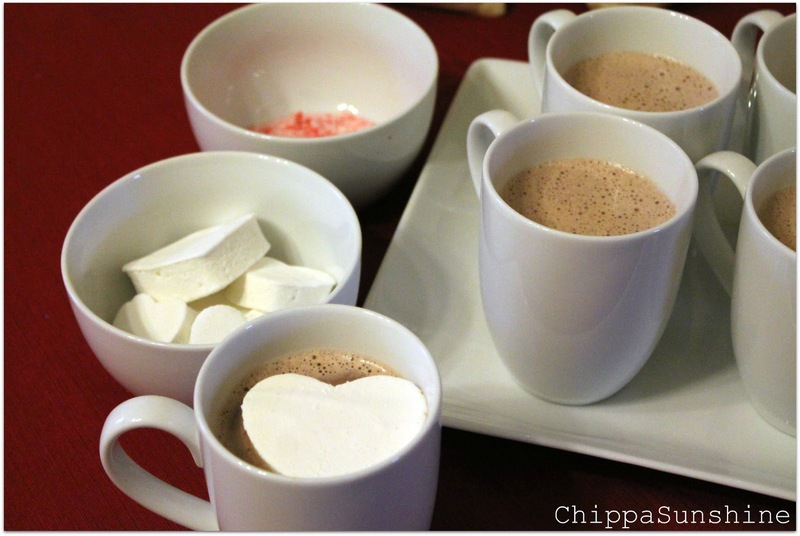 Before Christmas I made homemade marshmallows to have with our hot chocolate. This time of year we drink a lot of hot chocolate and what better way to drink it than with marshmallows. 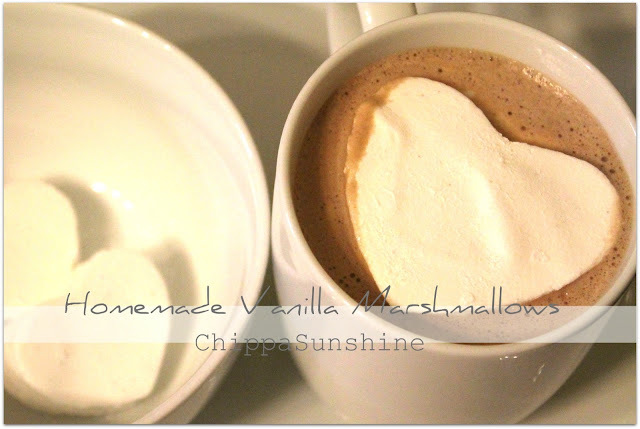 Most marshmallow recipes have the same few ingredients and instructions so I compiled a few recipes and made my own. This is such a easy recipe and doesn't take long to put together. You just have to wait, which mind you is the hardest part. This recipes makes a lot of marshmallows. 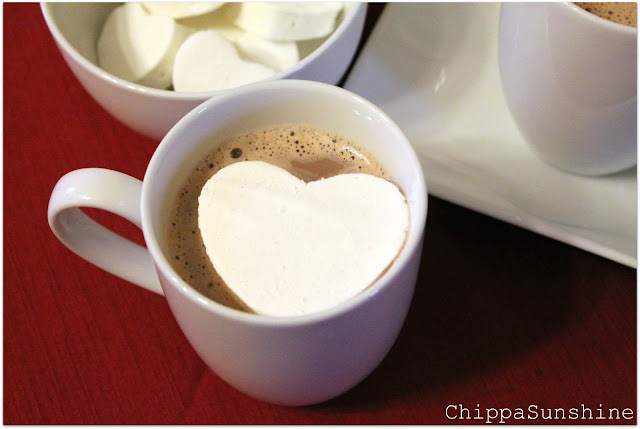 We used ours in hot chocolate, but it would be great to give as gifts or to make smores. We did the whole taste test to see if they are better than store bought. The verdict is in, YES! Make some for yourself, they are D-E-licious! Lightly spray a 11-by-15-inch baking dish, can be metal or glass, with cooking spray. Generously dust baking dish with confectioners' sugar. 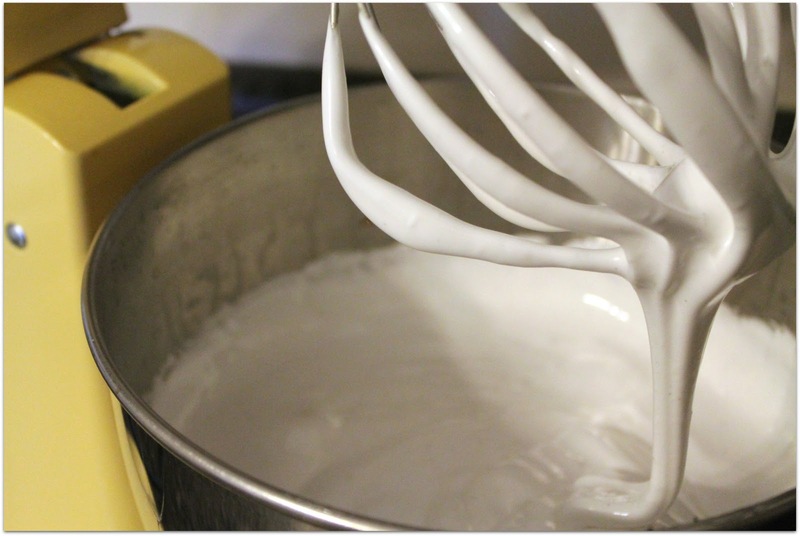 In the bowl of an electric mixer fitted with the whisk attachment, sprinkle gelatin over 1/2 cup cold water. Allow to sit while you make the syrup. In a medium saucepan, combine the sugar, corn syrup and 1/2 cup water. Cook over medium heat until the sugar dissolves. 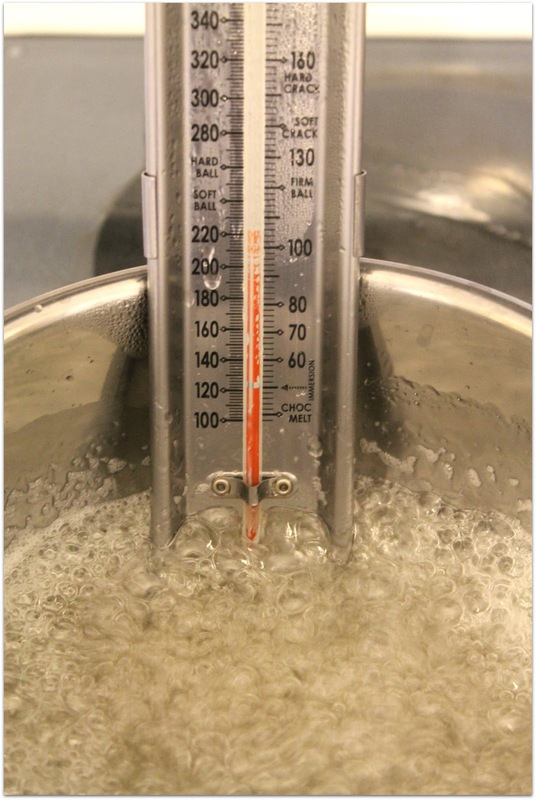 Raise heat to high and cook until the syrup reaches 240 degrees on a candy thermometer. Do not stir mixture. Remove from heat and add the salt. With the mixer on low speed, slowly pour the boiling syrup into the dissolved gelatin. Be very careful you don't won't the hot mixture to splatter. Put the mixer on high speed (8) and whip for 15 minutes. The mixture will be very thick. Mix in the vanilla extract and vanilla bean seeds until well combined. Pour the marshmallow mixture into the prepared pan, smooth the top and dust with confectioners' sugar. Allow to stand uncovered overnight. Once the marshmallow is set, run a knife all around the edge of the pan to loosen the marshmallow. 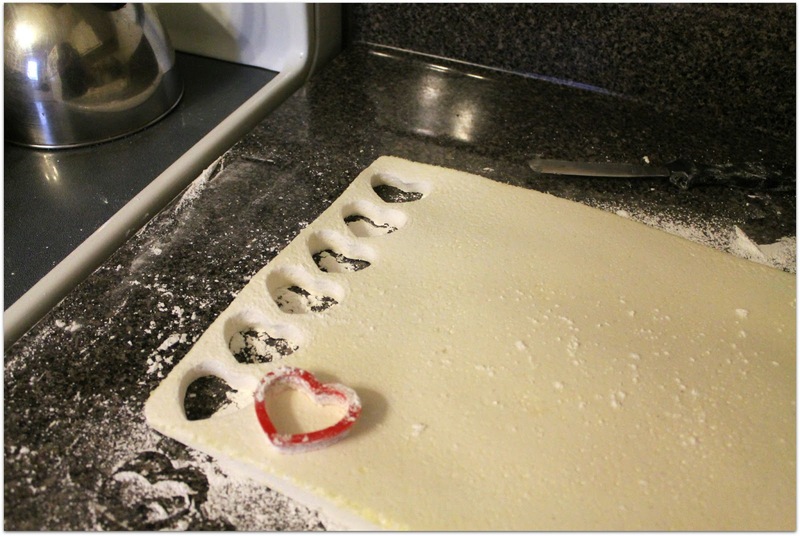 Turn the marshmallow out onto a work surface dusting with confectioners' sugar and cut them in squares. You can also use cookie cutters, dusted with confectioners' sugar, to cut marshmallows into cute shapes. Place some confectioners' sugar in a large bowl. Working in batches, add marshmallows to bowl and toss to coat. Knock off any excess sugar and store in an air tight container, for up to two weeks. Linking up with 33 Shades of Green, Adorned From Above, Sew Much Ado, The Life of Jennifer Dawn & Shabby Nest! Hi quick question? What is and does a vanilla bean seed look like? I kno I know u must think I dont cook alot! oh my goodness, they are so cute!!! These are so cute! I plan to attempt making my own marshmallows this year. I'm now following on Google+, found you through Adorned from Above. Thanks Christina for stopping by and checking out my marshmallows. I am glad you starting following me, I am trying to get the hang of Google+. If you have any pointers send them my way! I didn't even think of that, but they would be perfect for Valentine's Day! Looks great and so cute!! Let me know how they turned out when you give them a try. They are really delicious and the family voted they are BETTER than store bought! Head over and get your featured blogger button.